But before we look too much into the FHFA’s Home Price Index, it’s important that we’re cognizant of its shortcomings; the most important of which is its lack of real-time reporting. According to the National Association of Realtors™, 80% of purchases close within 60 days. As a result, because of its two-month delay, the Home Price Index report actually trails today’s market data by an entire sales cycle. If you’re wondering whether now is a good time to buy a home , consider low prices, cheap mortgages and an available tax credit as three good incentives. By May, none of them will likely be available. The Federal Open Market Committee ends a scheduled, 2-day meeting today in Washington. It’s the first of 8 scheduled meetings for the policy-setting group in 2010. The group adjourns at 2:15 PM ET. As is customary, upon adjournment, the Fed will issue a press release to the markets recapping its views of the country’s current economic condition, and the outlook for the near-term future. The post-meeting statements from the Fed are brief but comprehensive. And Wall Street eats them up. Every word, sentence and phrase is carefully disected in the hope of gaining an investment edge over other active traders. 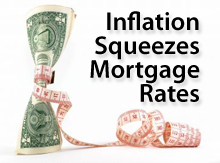 It’s for this reason that mortgage rates tend to be jittery on days the FOMC adjourns. Wall Street is frantically rebalancing its bets. Today should be no different. 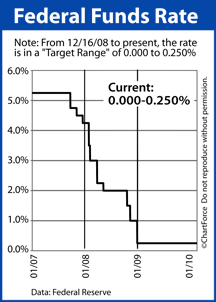 The FOMC is expected to leave the Fed Funds Rate within its target range of 0.000-0.250 percent — the lowest it’s been in history. However, it’s what the Fed says Wednesday that will matter more than what it does. The economy is gradually improving, the Fed told us, but there are still risks to the economy ahead. Furthermore, inflation remains in check. 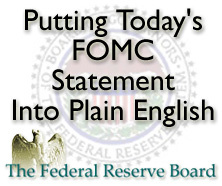 As compared to December’s press release, today’s FOMC statement will be closely watched. If the Fed changes its verbiage in any way that alludes to strong growth and/or inflation in 2010, expect mortgage rates to rise as Wall Street moves its money from bonds to stocks. Conversely, reference to slower growth in 2010 should lead rates lower. 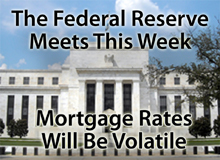 We can’t know what the Fed will say so if you’re floating a mortgage rate right now or wondering whether the time is right to lock, the safe approach would be to lock prior to 2:15 PM ET Wednesday. After that, what happens to rates is anyone’s guess. Just one month after blowing away Wall Street, December’s Existing Home Sales hit the skids, shedding nearly 17 percent and falling to a 4-month low. Don’t be alarmed, though. The plunge was expected. 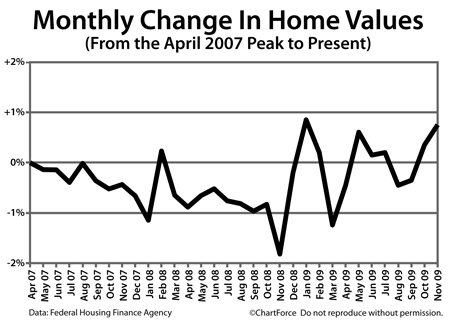 And not just because Pending Home Sales cratered last month. When November’s Existing Home Sales surged, it was clear to observers that an expiring $8,000 federal tax credit was the catalyst. At the time, the tax program was slated to expire November 30 and the looming deadline pushed a lot of would-be buyers from a December time frame into November. 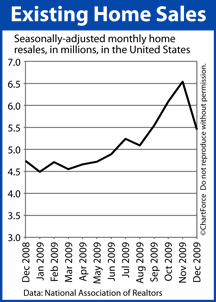 The expiration date had a cannibalizing effect on December’s sales figures. 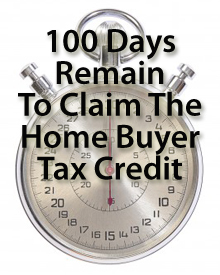 It was only later that Congress extended the tax credit to June 30, 2010. So, with home sales plunging in December, it’s no surprise that home supplies rose for the first time in 9 months. Home Supply is calculating by dividing the number of homes for sale by the current sales pace. The national housing supply now rests at 7.2 months. Despite December’s Existing Home Sales report appearing shaky, it’s actually terrific news for home buyers. See, for the past few months, as housing has been improving, sellers nationwide have been bombarded by messages of “hot markets” and rising home prices by the media. Psychologically, a seller is more likely to hold firm on their price if he believes the housing market is improving and now December’s data is deflating that argument. This is why we say there’s always two sides to a housing story — the buyers’ side and the sellers’ side. And, usually, what’s good for one party is bad for the other. It’s what we’re seeing now. Because of soft data like December’s Existing Home Sales, buyers may retake some negotiation leverage that’s been lost since Spring 2009, helping to improve home affordability and, perhaps, spur more sales. As a result, Utah mortgage rates fell for the third straight week. 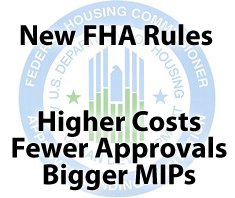 Securing an FHA mortgage in Utah is about to get more expensive. So far, 2010 has been favorable for mortgage rates in Utah and around the country. If you’re in need of a rate lock, this week may be a good time to take one. You are currently browsing the KeithSargent's Blog blog archives for January, 2010.